The 35th Infantry Regiment Association salutes our fallen brother, SP4 Thomas Edward Lilley, who died in the service of his country on February 19th, 1968 in Quang Nam, Vietnam. The cause of death was listed as Mine. At the time of his death Thomas was 21 years of age. He was from Toms River, New Jersey. Thomas is honored on the Vietnam Veterans Memorial at Panel 40E, Line 24. The decorations earned by SP4 Thomas Edward Lilley include: the Bronze Star, the Purple Heart, the National Defense Service Medal, the Vietnam Service Medal, the Vietnam Campaign Medal and the Vietnam Cross of Gallantry with Palm Unit Citation. 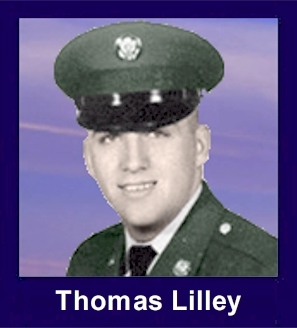 The February 28, 1968 Ashbury Park Press reported that Thomas E Lilley was killed in action in Vietnam on February 19, 1968. The 21 year old soldier was the son of Mr. and Mrs. Warren J Lilley Sr. of 128 Walnut Street. Sp/4 Lilley had spent 8 months in Vietnam and was scheduled to return home in June. An Army officer from Ft Dix advised the family that Lilley was missing in action. The next night, two other Army officers said that his death had been confirmed. The family was told that Lilley was last seen driving a truck that was attacked by the enemy. No other details were released. Sp/4 Lilley entered the Army in July 1966 and took basic training at Fort Dix. He completed a transportation school at Fort Sill, OK. And was sent to Vietnam June, 1967. Thomas Edward Lilley was born on January 30, 1947 and raised in Toms River, New Jersey. He graduated from Toms River South High School in June 1965 and enjoyed bowling, football, golf, drawing, collecting coins and stamps and designing blue prints of homes. He was a 1965 graduate of Toms River High School. While in school, Lilley was co-captain of the bowling team that took state championship honors. After graduating he worked for the Western Electric Co. for more than a year before entering the service. He was born in Hackensack and came to Toms River with his family in 1961. Also surviving were his maternal grandmother, Mrs. Florence Monsant, East Rutherford; four brothers: Warren J Jr., Robert J., James C, and Kenneth J. and three sisters: the Misses Kathleen F., Judith A., and Patricia A., all of Toms River. Tom was the oldest of 8 children and such a good big brother to his 4 brothers and 3 sisters. My mother and dad had 4 girls and no boys. Tom was loved so by my dad, because he never had a son. Dad started to teach Tom how to bowl and how to play golf when he was only 10 or so - my husband didn't play golf or bowl, but he was happy that my Dad helped Tom become such a good golfer and bowler. When Tom and my oldest daughter, Kathy, were in high school, Tom always watched out for her and made sure that Kathy didn't go out with bad boys. Tom was the one who introduced Kathy to Tom Palmieri and years later my daughter married him. As a matter of fact, Tom Palmiere was the one who escorted my son's body back to the United States. At first they couldn't locate Tom Palmieri in Vietnam and when they finally located him, our son's body was already on the way back to the states - but Tom Palmiere met up with Tom's body and escorted him back to Toms River, NJ. For meritorious service in connection with military operations against an armed hostile force in the republic of Vietnam. Specialist Four Lilley distinguished himself while serving as a Truck Driver, and later Truck Master, in the Transportation Section of HHC, 2/35th Infantry. Specialist Four Lilley participated in numerous convoys to the forward areas, which were often through hostile territory. He frequently spent many hours a night ensuring top performance in his vehicles. Due to his outstanding ability, Specialist Four Lilley was given the job of Truck Master. The resulting highly effective resupply element was a great factor in the suppression of the enemy and a great morale factor to the men in the forward areas. On 19 February, Specialist Four Lilley was mortally wounded by hostile mine fragments while on a resupply mission near Que Son. Specialist Four Lilley's outstanding achievements, professional competence, and devotion to duty are in keeping with the highest traditions of the military service and reflect great credit upon himself, his unit, and the United States Army.